I have several things to show you this week, but none of them are photographed yet! I was having too much fun with my boys at the pumpkin patch and watching the Huskies beat the Beavers this weekend (woo hoo!). Here's one I did get a chance to snap a photo of, just in time to send off to my new nephew who's coming this Wednesday! I found this pattern over at FaveCrafts and LOVED it! 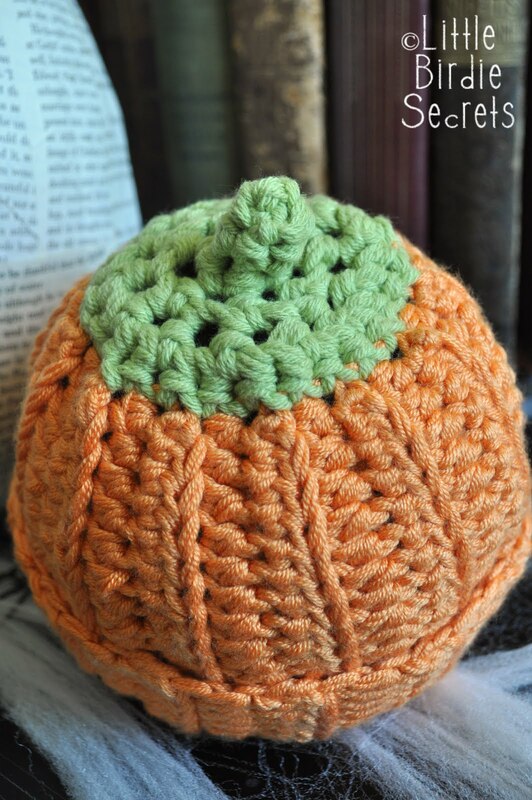 It almost looks knitted because you don't crochet it in the round. I've never done a hat like this before, but it was super fast and easy, and has a really different look than other crocheted hats. Plus, you can switch the color and make this an apple, blueberry, etc. In fact, as soon as I get my hands on some red yarn I am totally making my niece a strawberry hat. SO cute! 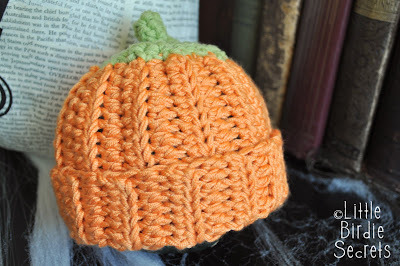 The pattern is for 0-3 months, but it would be super easy to make for a larger baby/child. Just increase your initial number of chains, and then make it a wider strip. The top is just kind of figure out as you go anyway, so it would be easy to adjust to a longer, wider strip. My boys were both "pumpkin" babies (born in October). I wish I'd had this pattern back then! Oh well. They're still my "pumpkin babies!" They are adorable I love them. 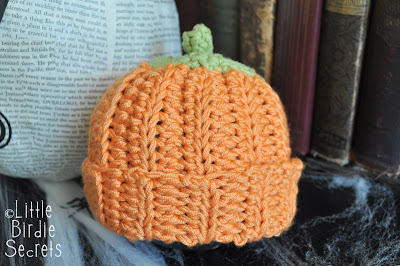 Off to check out the pattern and to Michaels to get some orange yarn :O) Thanks for sharing. I made a similar pumpkin hat last year at this time, as our "little pumpkin" was born on Halloween. Fantastic pattern - thanks so much for sharing the link! That is so cute! I'm just starting to learn how to crochet and would love to give this hat a go. What handsome young men you have. Looks like a great time at the pumpkin patch. The little hat is just precious! soooo cute! quick question- how much would you increase the stiches for a one year old? from 25 to lets say 30? more? i understand to make it wider so from steps 2-23, do something like 2-30? What yarn did you use for your hat? It looks so pretty. I just love the way that yarn looks! Thanks for sharing and I love the pics of your family! Love the look of your hat...what yarn did you use? I know it made all the difference when compared to the hat in the pattern instructions.